In early spring I took a leap of faith and ordered 10 bare-root roses from the online shop of a major supermarket here in Denmark. The price was ridiculously low, so obviously I was prepared for inferior quality and perhaps less than 100% survival rate. I ordered 5 New Dawn climbing roses and 5 Rhapsody in Blue roses, and if just one of each survived it would still be cheaper than if I had bought them directly from a reputable nursery, so I figured it was worth a shot. Well, the New Dawn roses were duly planted around the hammock trees (a cherry plum and an oak), both of which could do with some decoration, and in spite of being planted as close to the trees as possible these roses are doing just fine. The deer took a nibble of them at first, but then they sprouted new shoots and even some flower buds, so all is well. The Rhapsody in Blue roses, though, were destined to have their own section of The Ambitious Border, but… That section hasn’t happened yet. At all. So in order to keep the plants alive I heeled them in in a pot, all five together, and stuck it in a shady corner of the courtyard until I could get around to creating a place for them to live. Much to my surprise, all five plants are still alive and well, and they are even flowering! 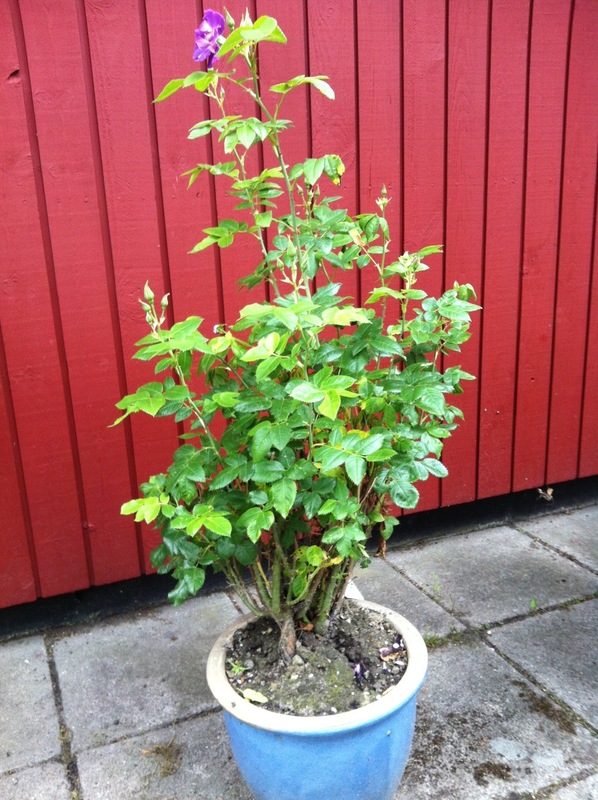 Five roses, squashed together in a 10″ diameter pot, and they have survived and even thrived! I’m amazed at how well they are taking their maltreatment. They’ve not had any fertilizer, compost or anything; I just stuck them in a pot and filled it with clay because I thought it would just be for a few weeks and clay has such great water retention, but clearly clay is all they want! It just goes to show that not ALL supermarket roses are bad – though most probably are… Especially the ones sold in-store in 3″ pots… Mind you, this particular supermarket chain doesn’t stock the plants themselves; they are just the middle-man; the roses came from a Danish nursery and were then shipped with an independent logistics company, so they were by no means the sort you’d find on shelves outside your local supermarket. 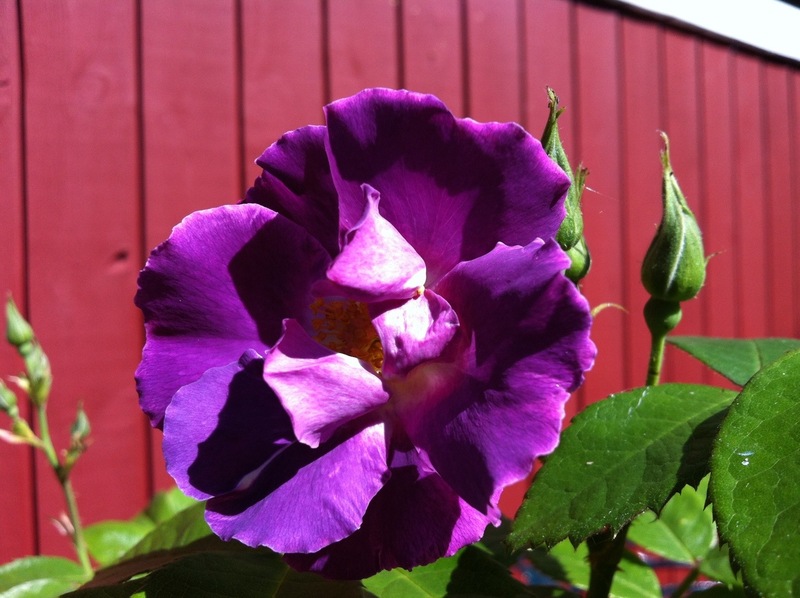 And though hardly any of my readers are Danish, just in case… Roses from bilka.dk are great value for money! Right, so last time I went up to the garden my luggage contained three rhododendrons… This time the luggage was lighter, but the number of plants greater! 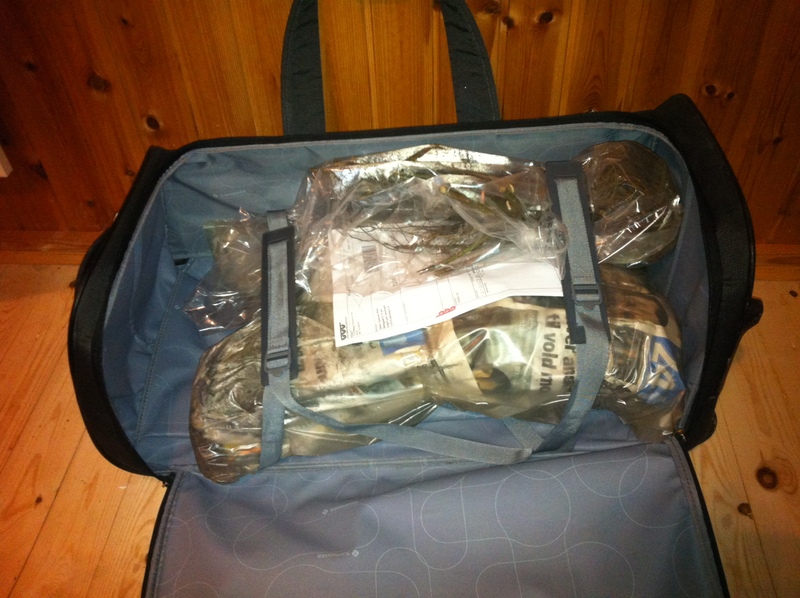 In case you can’t see it – which is understandable – this is a bag full of roses. Three red L.D. Braithwaite that will go in the Sunny Border, 5 New Dawn that will be planted 2 by each of the trees that carry the hammock in summer and one to be planted wherever I might think of it. And to top it off there are also 5 Rhapsody in Blue, just because I like the outlandish blueish-purple hue of these roses. So 13 roses to be planted, and only the site for the L.D. Braithwaites is prepared. That should keep me busy this Saturday and Sunday, I reckon! Of course the New Dawn roses will be planted in the lawn, so I will do yet more cutting away turf at the foot of the trees that will act as trellises for them. I suspect this is a bit of a suicide mission, but never mind. Less grass, more flowers! The Rhapsody in Blue is the joker in this game; I have no idea where to put them, but I guess I could stick them in the Ambitious Border in the area where I sowed annuals last year. Anyway, I’ll work that out once the Braithwaites and New Dawns are in the ground.